Muslim Brotherhood in Jordan holds protest calling on government to respond to Temple Mount closure by cutting ties with Israel. Thousands swarmed Amman's streets on Saturday night in a protest calling on the Jordanian government to act immediately to halt Israel's "attacks" on Al-Aqsa Mosque and expel Israeli ambassador to Jordan Einat Schlein. The protest was held in response to Israel's decision to close the Temple Mount, which followed a terrorist attack in the Old City on Friday. Two Israeli police officers were murdered in the attack and another was wounded. According to reports in the Hamas newspaper Palestin, Islamic Movement supporters shouted slogans supporting the fight and encouraging acts of revenge against Israel, as well as condemning the Arab states' silence on the matter. 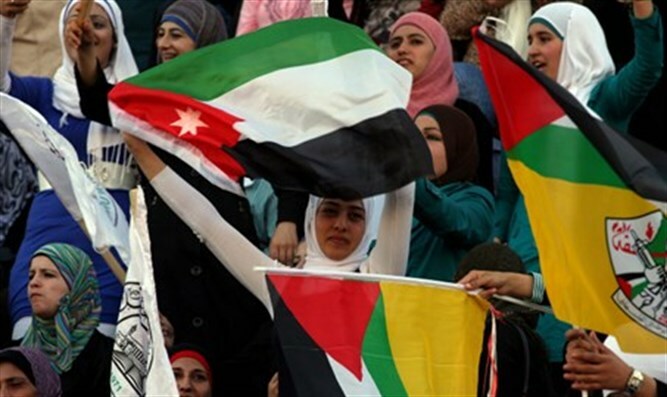 The protesters insisted Jordan cancel its peace agreement with Israel and stop the normalization of relations with the Jewish state. Muslim Brotherhood senior official Hamza Mansour said, "The Al-Quds' activities have proven Israel's failure to uproot the Arab heritage and Islamicism from the Palestinians who have been living under Israeli occupation since 1948." Israel respects the religion of Islam and Israeli Arabs enjoy full rights to practice their religion as they please. Jordan's government insisted Israel reopen the Temple Mount, and Israel acquiesced on Saturday night, promising that by Sunday afternoon, the compound would be reopened to Muslim worshipers.